A photograph purportedly showing a man with eye cancer caused by using his cell phone at night actually captures a case of pinkeye. A photograph shows a man who was diagnosed with eye cancer due to using his cell phone at night. I read an article about a young man who uses his cellphone at night for long periods of time and now has cancer of the eyes. I do this, and I know a lot of other people that do this. If this is real, then this information should be put out there. If not, people should know that as well in case they come across this article like I did. This unnamed 40-year-old man visited the doctor when he couldn’t see clearly, albumen turned red because of serious injuries. Whereby, he always use mobile phone for 30 minutes in the dark before going to sleep. It was prolonged, made his macular’s eye degraded, lead to impaired vision and signs of eye cancer. 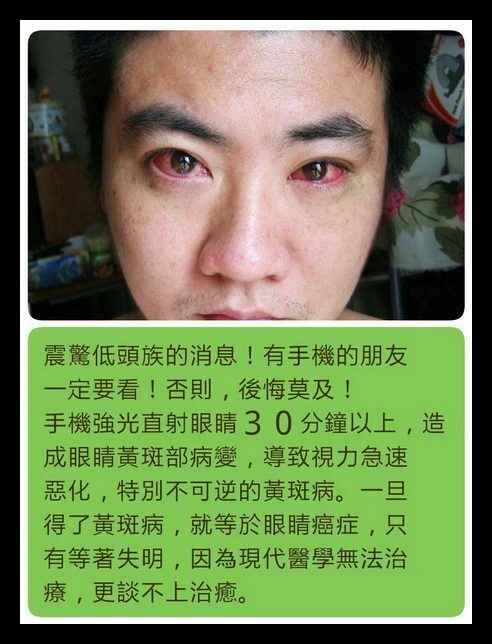 This photograph dates to at least 2013, when it was uploaded to Sinophoto.com as an example of conjunctivitis (more commonly known as “pinkeye”), a condition marked by redness and swelling of the mucous membrane that lines the eyelid and eye surface. The American Cancer Society, the U.S. National Library of Medicine, and the American Society of Clinical Oncology have not issued any warnings concerning a connection between cell phone use (at night or otherwise) and eye cancer.